Kevin Freeman was a Forward for the UConn Huskies from 1996 – 2000. He’s a member of the UConn Basketball All-Century Team, and he played on UConn’s first ever National Collegiate Athletic Association (NCAA) Championship Team in 1999. Kevin was named the Most Outstanding Player in the Big East Tournament, and was a member of the NCAA West Regional All-Tournament Team in 1999. Kevin ranks number one in career games played at UConn with 140. I had the opportunity to talk to Kevin in August 2010, about his basketball memories and experiences. “At UConn my best memory was helping to win UConn’s first ever NCAA Championship. 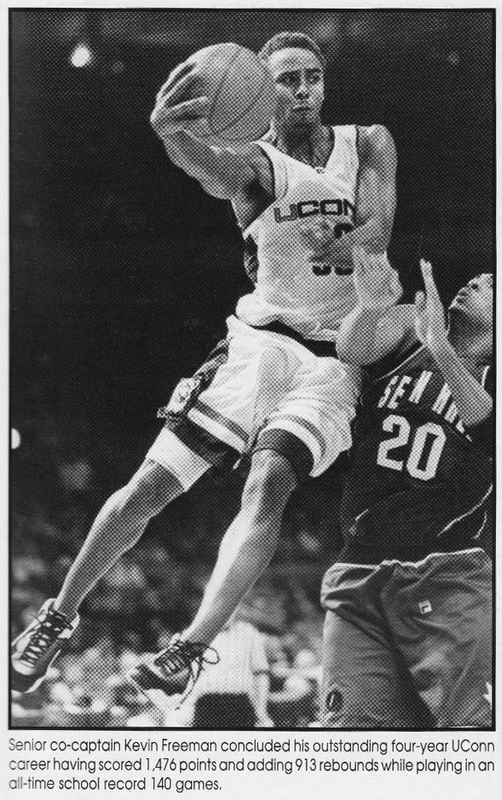 Individually, winning the MVP at the Big East Tournament in 1999 was my most memorable moment.” Other accomplishments of Kevin’s while at UConn include being one of only two players in school history with over 1400 points and more than 900 rebounds. He left UConn ranking number thirteen on career scoring list with 1,476, and number four in career free throws made with 422. Kevin has been playing in Italy, Australia, Spain and Greece for the past eleven years. In 2006 he took a season off and came back to UConn to finish earning his Bachelors Degree in Political Science. After getting his degree Kevin went back to Europe to play. “I’m still going to play for maybe another two seasons then I’ll be done.” This season he is playing in Venezuela. Kevin is married and was approaching his first anniversary when I spoke to him. He and his wife Nicole met during his college years but she was from nearby Eastern Connecticut State University.